A common and very significant issue in young children is the presence of fluid in the middle ear. 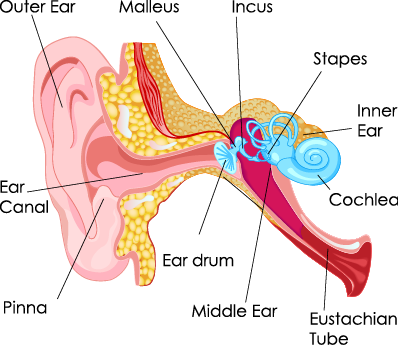 The middle ear is the space behind the eardrum that contains the three tiny bones of the ear—the incus, malleus, and stapes. This space is normally filled with air. When sound waves travel through the ear canal and cause the eardrum to vibrate, this vibration is then transferred to the bones of the middle ear, carrying the signal on to the structures of the inner ear. When fluid builds up in the middle ear—due to ear infection, allergies, cold, or Eustachian tube dysfunction—it hampers the movement of the eardrum and the bones, thereby affecting how the sounds signal is transferred. When a developing child’s hearing is affected in this way, it not only affects how they hear sounds, but also how they learn to process the sounds that they hear. Our own observations in working with thousands of children support the idea that chronic middle ear fluid can significantly impact a child’s processing, speech, language, intensity, and behavior. However, sometimes we are not aware that fluid is an issue until we begin to see some of these secondary effects. Some children may not show any outward behavioral signs of fluid unless it accompanies an actual ear infection. Sometimes fluid goes undetected until we begin investigating possible causes of a child’s speech delays. Diagnosing middle ear fluid is a simple process. An audiologist or ENT will attempt to view the child’s eardrum with an otoscope to look for signs of fluid or inflammation. Then she will use a quick, objective diagnostic tool, tympanometry, to assess the function of the middle ear. To obtain a tympanogram, all that is required is that the child sits still for a few seconds while a probe is placed in the ear canal. The audiologist or ENT will interpret the test results and be able to identify whether or not the middle ear is functioning normally. Keep in mind that the tympanogram only gives information regarding middle ear status at that point in time. Therefore it may be necessary to have several tympanograms periodically over a few months in order to determine whether chronic fluid is present. If you determine that your child does have chronic middle ear fluid, a common treatment is the placement of tiny tubes into the eardrum, or tympanic membrane. The tubes allow the fluid to drain and for the pressure to equalize on either side of the eardrum. Tube placement is a simple same-day surgical procedure, requiring brief general anesthesia. Sometimes the procedure must be repeated if the tubes fall out prematurely and the child still has fluid problems. After the tubes fall out or are removed, the tympanic membrane usually heals by itself, and no further intervention is needed.